What is the Deaf Resource Library? 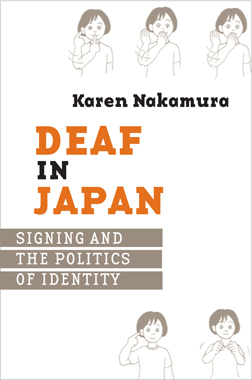 The Deaf Resource Library (http://www.deaflibrary.org) is a virtual library -- an online collection of reference material and links intended to educate and inform people about Deaf cultures in Japan and the United States; as well as deaf and hard of hearing related topics. While I have a bias towards cultural Deaf models, I have tried to include more material about hard of hearing issues as well. The information is collected here as a service to the Deaf, hard of hearing, and hearing communities. I gladly welcome contributions to this online library by e-mail (contributions <at> deaflibrary.org). However, I am unfortunately not able to respond to e-mailed questions about Deaf culture or Deaf society. I would kindly suggest asking the research librarian at your local college for assistance. You'll get an auto-reply back when you send me e-mail, you might want to read it here first! Another great source of everything to do about deafness can be found at the Laurent Clerc National Deaf Education Center Information on Deafness web site. Please check it out if you think I'm missing anything. Please, please notify me (brokenlinks <at> deaflibrary.org) if you notice any broken, moved, or outdated links. It's only with the help of others that I'm able to keep track of these many links. Please note that if it's not listed here or if the link is broken, I don't know where it moved to. Please try Google and if you find the link, please e-mail me it to me. Please note that I might not be able to update the site or respond to your e-mail immediately, but I'll do my best to remove dead links and add any new information that comes in. 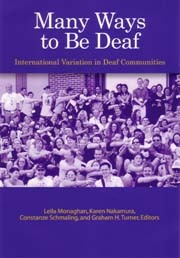 The Deaf Resource Library was created in 1995 and is being maintained by myself, Karen Nakamura. I'm an Associate Professor of Anthropology and East Asian Studies at Yale University. I've been studying disability culture, history, and political/social movements in Japan and the United States for the past decade. Please visit my academic home page at Yale for more information about my academic background and courses that I teach. These bibliographies were mainly for my own research purposes way, way back in 1995-98. I recoded the general bibliography to include a general reading list. I also strongly recommend visiting Amazon.com and typing in "Deaf" as a search topic. I haven't added to these bibliographies in the past several years decade, so they're a bit (quite? severely?) out of date. These are some community resources for Deaf, hard-of-hearing, their relatives, friends, etc. Spain: Federacio de Sords de Catalunya (Fesoca) -- "our federation is at the city of Barcelona (Spain, Europe) and gives different services to deaf people of the spaniard province called Catalunya (Spain)." USA: National Association of the Deaf (NAD) -- the national organization for Deaf in the U.S.
USA-PA: York-H-Burg - DeafCentral Pennsylvania Non-profit Organization. World: http://www.deaflympics.com/ - International Committee of Sports for the Deaf, or the Deaf Olympics, formerly called Comité International des Sports des Sourds, CISS (The International Committee of Sports for the Deaf). Korea:Korean Deaf WWW -- in English and Korean -- neat! Switzerland: Pisourd.ch -- " Un site destiné aux sourds, aux parents d'enfants sourds, aux professionnels de la surdité ainsi qu'à toute personne concernée ou/et interessée par la surdité"
USA: Deaf Professional Network - "an independent group which seeks to empower its subscribers to achive their professional and business goals"
USA: DEAFology 101 -- Comedy Entertainment by "Prof. Glick"
These are the only scholarships that I know of. (Please don't e-mail me asking if I know of any others because if I knew about them, I'd put them here). If you know of a scholarship that isn't listed, please e-mail and let me know. UK: DeafLingual.com - "communication and translation, Deaf awareness training, British Sign Language tutoring and media services"
USA: ASCDeaf.com - "Alternative Solutions Center is a Deaf-owned and operated psychotherapy and consulting practice staffed by licensed professional therapists." USA: International Hearing Dog - " We train dogs to assist people that are deaf and hearing impaired at no cost to them. Our organization places dogs all over the United States. The dogs help assist with alerting a person to sounds in their home and working environment." USA: Institute for Disabilities, Research, and Training (IDRT) -- "?Innovative Research and Development for People with Special Needs"
USA: ADARA is the American Deafness and Rehabilitation Association. They publish a professional journal called the Journal of the American Deafness and Rehabilitation Association or JADARA. USA: http://www.k12academics.com/ushers_syndrome.htm - a website devoted to providing resourceful information for a number of topics in education and disabilities and disorders ... with an information page for Usher syndrome including signs & symptoms, history & cause, Usher Syndrome I, II & III, support services, special education schools & books for the genetic impairment. USA-FL: National Deaf Academy -- " a unique residential treatment facility for Deaf and Hard of Hearing children, adolescents and adults"
USA-IL: Illinois Service Resource Center -- " the coordination center for services for children throughout the State of Illinois who are deaf or hard of hearing and exhibit behavioral and mental health challenges"
USA-MA: Boston Center for Independent Living, has just been awarded a contract that allows us to offer free specialized telecommunications equipment to all eligible applicants in Massachusetts. USA-NY: The New York City Access Resource Guide for the Deaf, Deaf-Blind and Hard of Hearing "provides a comprehensive listing of resources throughout the five boroughs available for Deaf, Deaf-Blind, and Hard of Hearing people, their families, and service providers." Canada: The Signer's Network -- "News, Info & Support for Canadians who use American Sign Language"
USA: Real World Success -- "Professional Development and Success Motivation services for the Deaf and Hard of Hearing individuals"
Sign Language Assessment Web Site -- "review on different sign language assessments and provides information on test development and testing"
SignStream is a database tool for analysis of linguistic data captured on video and a product of the ASLLRP (above). USA: ASL: Fact and Fancy -- "text and pictures are copied from an out-of-print booklet that dispells seven common myths about ASL"
USA: American Sign Language Linguistic Research Project (ASLLRP) --- a collaborative research project, involving researchers at Boston University, Dartmouth College, Gallaudet University, and Rutgers University. Also see SLLING-L mailing list below. USA: Chris Niemeyer Fingerspelling -- "Read text as if it were being fingerspelled"
USA: Sign with your Baby is a new book by Joseph Garcia that recommends teaching sign language to both hearing and deaf babies, quite interesting! USA-NC: BEGINNINGS -- for Parents of Children Who are Deaf or Hard of Hearing, Inc.
USA: Deaf Reformed Ministries -- religious deaf organization lead by deaf leaders. ; fax 914-699-6954) for details. This should be the first place to check if you're interested in becoming a terp. USA-SC: Communication Access Network, Inc. -- "Sign Language Interpreter services company headquartered in Charleston, SC"
USA: Captioned Media Program -- "Provides free-loan captioned films/videos service to Deaf/HOH, parents, teachers, and others working with Deaf/HOH; provides free captioning information to media producers/distributors and others; provides listings of captioning agencies; and evaluates captioning agencies who perform open-captioned work for the U.S. Department of Education." USA: The Verbatim Court Reporters Center contains a searchable database of competent, professional court reporting, realtime, captioning and other related support services. VRC also serves as a world-wide resource for members of the deaf, hard of hearing, and late-deafened communities seeking to locate realtime and/or captioning services. www.windmillworks.com - created several software programs for deaf and hard of hearing students that employ matching games to reinforce vocabulary and syntactic structures. http://www.signgenius.com - a software company specializing in the development of educational sign language software. NurseWeek's Hearing Loss: the Hidden Epidemic -- written by two RN's who are hearing impaired (their terminology); the article gives a good description of adult onset hearing loss; although is scant on the concept of being culturally Deaf. Healthy Hearing -- "information on hearing aids, hearing loss and hearing healthcare"
Audiology Online -- "information on hearing aids, hearing loss and hearing healthcare"
Beauty of Hearing Aids Chat Group -- hosted by Yahoo! USA: SHHH- Self-Help for the Hard of Hearing -- one of the largest and best organizations for the hard of hearing in the U.S.
-- Informed consent warning: there have been some complaints of Mr. Stassler involuntarily adding ("spamming") people onto his e-mail list and refusing to take them off. , leave subject blank, in body, type "sub deaf-magazine firstname lastname"). The Sign Language Linguistics List (SLLING-L) can be accessed either through its web archive page or by subscribing online. with the message body saying "SUBSCRIBE TERPS-L FIRSTNAME LASTNAME". Leave the subject blank. "Beyond hearing" appears to be a mailing list for hard of hearing, late deaf, and other folks. There are a bunch of professional people on it and many of the members belong to SHHH (Self-Help for the Hard of Hearing). If you think this fits your interests, you can subscribe by mailing to "
Deaf Jokes (www.deafvision.com/lists/deafjokes/) -- get a new deaf joke in your email box once a month! FLASH (www.deafvision.com/lists/FLASH) -- national news and announcement 'zine for the Deaf Lesbian, Gay, Bi and Transgendered community. Published electronically since 1994. USA: DeafVision, Inc. - professional web design and hosting services. Free hosting for Deaf nonprofits. Deaf Latina owned and operated. USA: www.buyasl.com - sells many ASL products such as ASL dictionary dvds, and books, deaf education, and many more. USA: Deaf Resources - a family-owned online retailer of Deaf and HOH products.... offer an extensive selection of assistive devices, educational materials, books, videos, clothing, jewelry, baby items, stationery, tote bags, and holiday-based gift baskets. Bonus: Weird sites that have me crosslinked! Quebec's Unofficial Scuba Page--- ????? Web Cafe's Review of this site -- didn't even know about it! WWW Virtual Library's list of Japanese network resources. Yahoo's Web page of anthro (including archaeological) resources. Yahoo's Web page of general social sciences resources. NTT's list of WWW servers in Japan. Little comments in italics are from the Peanut Gallery (me). The painting of two women is by Renoir. The Deaf Resource Library is a not-for-profit project that I've been running in my spare time since 1995 and I receive no outside funding for its maintenance. This page last updated on Dec 21, 2014. Copyright (C) 1995-2014 by Karen Nakamura. All rights reserved. The Deaf Resource Library is a winner of the Deaf Watch Gold Award as well as AnthroTech Site of the Week and as a "Three Star Site" at the ABC's of Parenting.